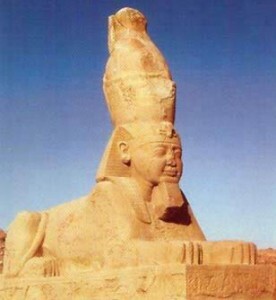 THE GREAT SPHINX IN THE AGE OF LEO? The most important time of the year in Egypt (before the building of the High Dam at Aswan in 1965) was the season of Innundation when the Nile would flood the adjacent land and fertilize the crop. This all important event took place between the summer solstice (end June) and the autumn equinox (end September). 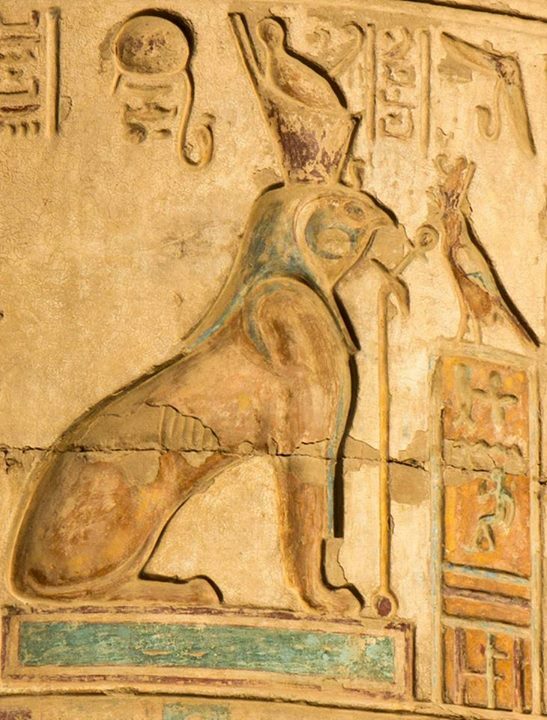 The first dawn appearance of Leo at summer solstice would have signified to an ancient observer c. 3000-2000 BC that the Nile Flood was about to begin. 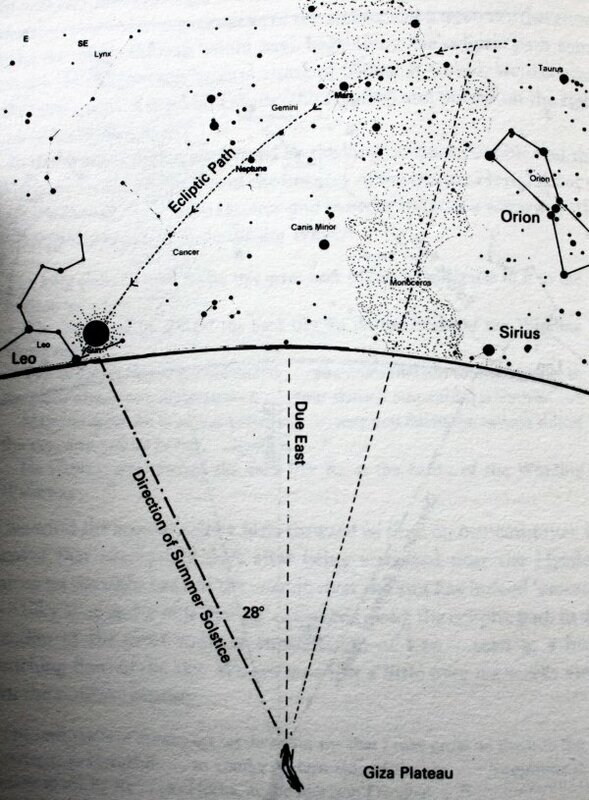 Since also the star Sirius would also be making its first dawn rising –known as the Heliacal Rising– at the same time, then the signal would be interpreted metaphorically as the sun entering or joining Leo in the horizon when the start of the Nile Flood and when also Sirius would first be seen. Image 1: The image in the eastern horizon at dawn c. 3000 BC at the start of the Nile flood i.e. summer solstice. 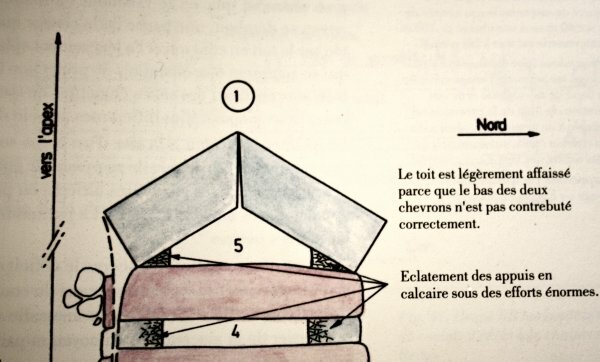 There are several passages in the Pyramid Texts that are metaphorical descriptions of “the sun entering or joining Leo in the horizon when the start of the Nile Flood when also Sirius would first be seen”. 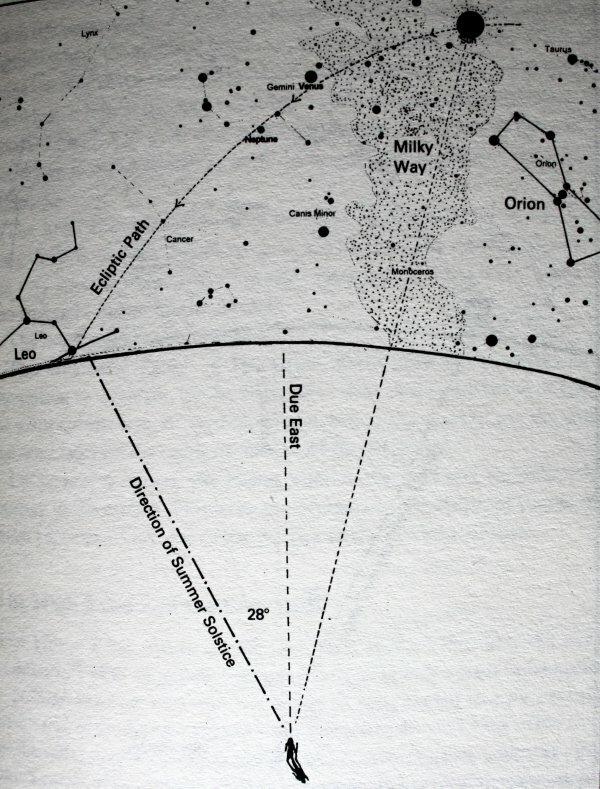 It these various passages the sun is called ‘Ra’, and the Milky Way is called ‘Winding Waterway’ (Mer-Nekha). There is also another celestial figure called Horakhti (Horus of the two Horizons) which I would suggest is the constellation of Leo. 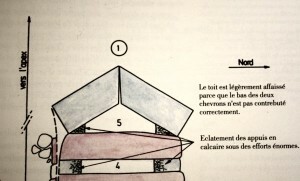 These Pyramid Texts, said to date from 2300 BC, actually describe an observable celectial event witnessed around 3000-2000 BC: the crossing of the sun disc on the Milky Way, and making its way eastwards to reach the zodiacal constellation of Leo at the time of the summer solstice, at the same time that the star Sirius rises heliacally and when the Nile flood begins (the exact date for this conjunction falls on c.2780 BC). 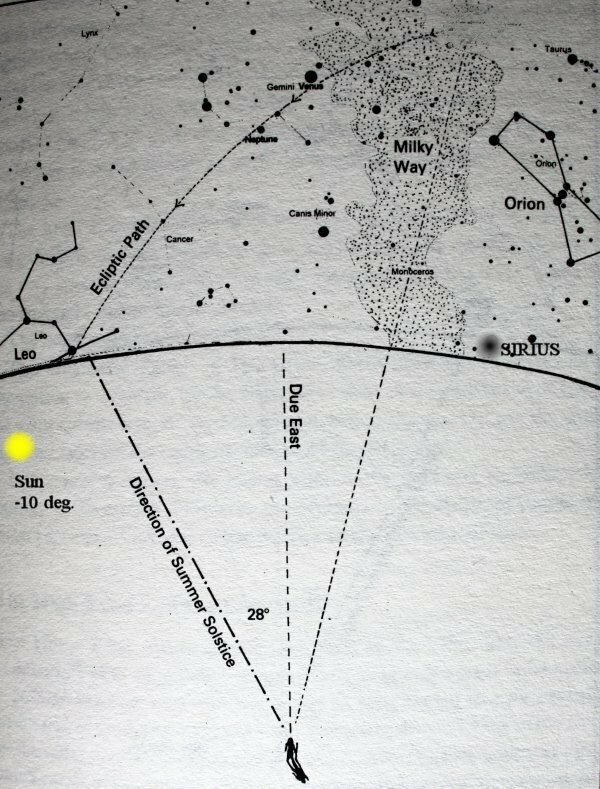 There can be little doubt that the figure in the eastern horizon we call Leo today was, to these ancient observers, Horakhti (Horus of the two horizons). Iamge 3: the sun (Ra) reaches Horakhti (Leo) at the time of the summer solstice c. 2300 BC. But did the ancient imagine Horakhti as being a lion in the sky? Horakhti i.e. 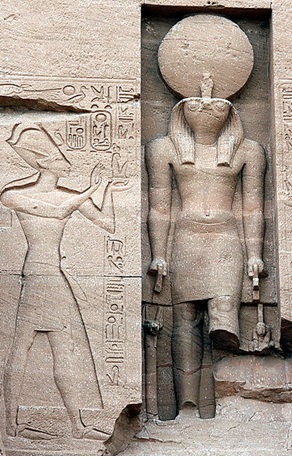 ‘Horus of the two Horizons’ was generally depicted as a man, probably the pharaoh, with a falcon head, and doning a sun-disc over the head. 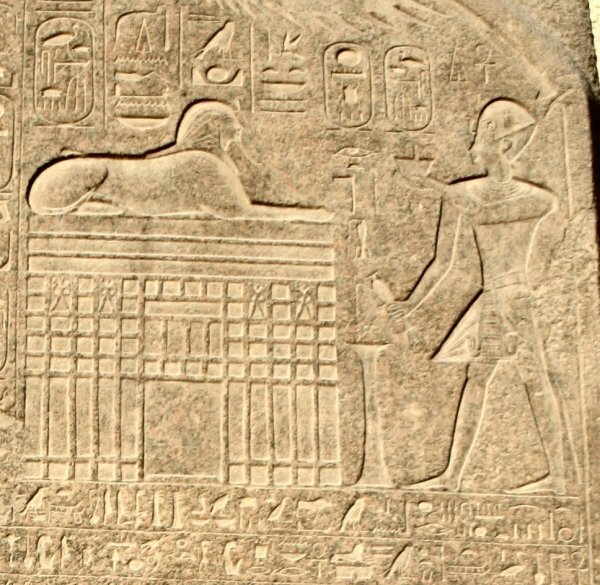 Image5: Amenhotep III and Horakhti. 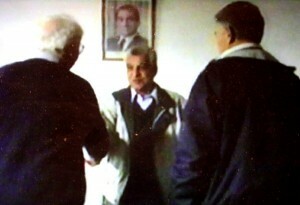 Here the king is identified to Horakhti. The face of Amehotep III is thus interchageable with that of Horakhti i.e. man becomes falcon and vice-versa. Temple of Amehotep III, Luxor, West Bank. 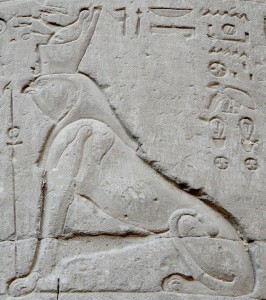 There are, however, several depictions of Horakhti as a lion with a falcon head wearing the royal double crown in the temples dedicated to Horus. 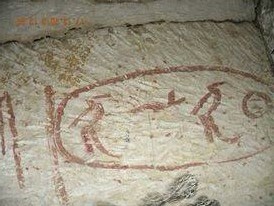 These two names, Horemakhet and Horakhti, have a very similar rendition. 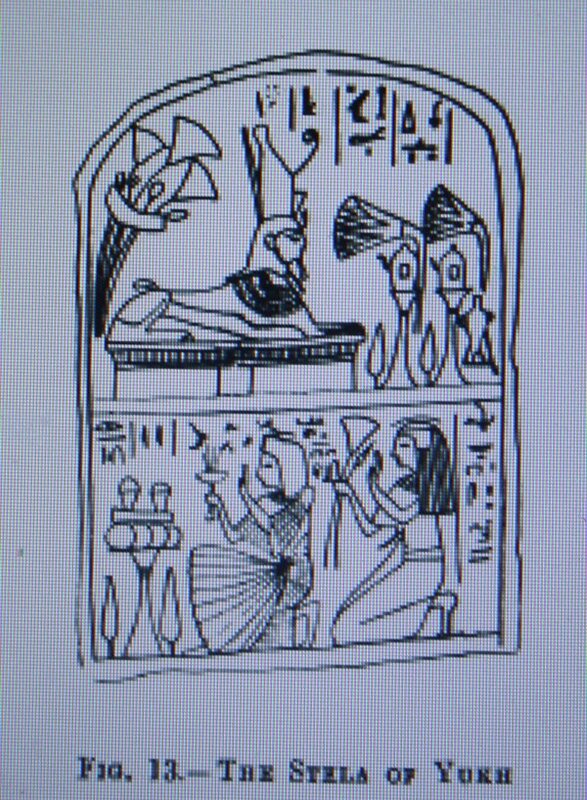 Horemakhet meaning ‘Horus in the Horizon’, and Horakhti meaning ‘Horus of the two Horizons’. 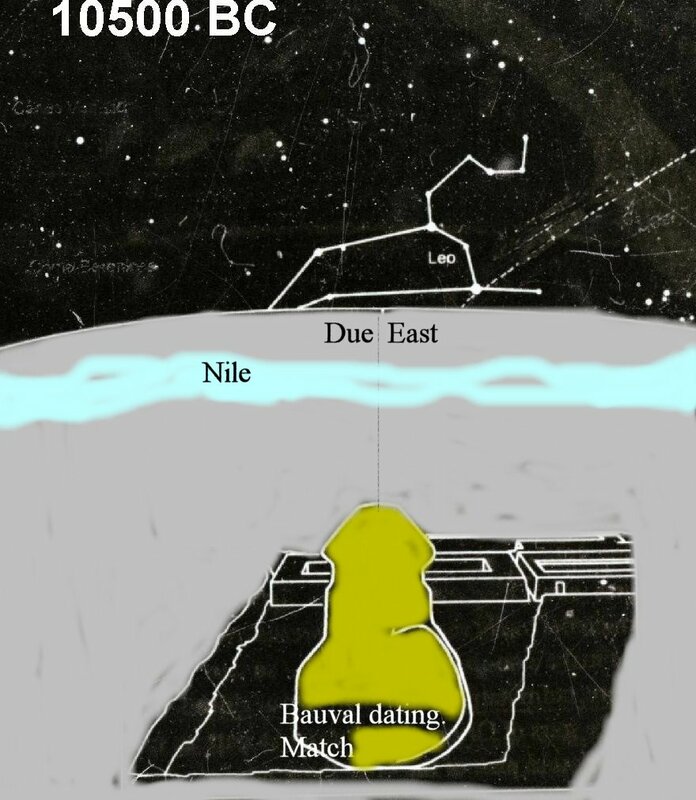 There is no doubt, however, that the name Horemakhet was exclusively used for the Great Sphinx of Giza, whereas the name Horakhti was used for a figure in the eastern horizon which I have identified to the zodiacal constellation of Leo and which was also idetified with the Great Sphinx. If this is the case, then there is a problem with allocating the Great Sphinx to Khafre, a king of the IVth Dynasty who reigned in c. 2500 BC is this: the Great Sphinx is gazing directly DUE EAST, whereas the constellation of Leo/Horakhti rose at that time some 28 degrees north of due east. 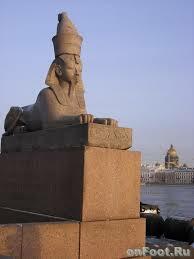 The correct epoch for the Great Sphinx to gaze at his own image would be 10,500 BC. What makes the Sphinx-Leo correlation of 10,500 BC unlikely to be a coincidence is that it ‘works’ in conjuction with the ‘beginning’ of the Prececessional cycle of Orion’s belt as seen in the southern sky, which can be matched on the ground with the Giza Pyramids. This ‘beginning’ I have identified to the golden age that the ancients called Zep Tepi meaning the First Time (of creation). 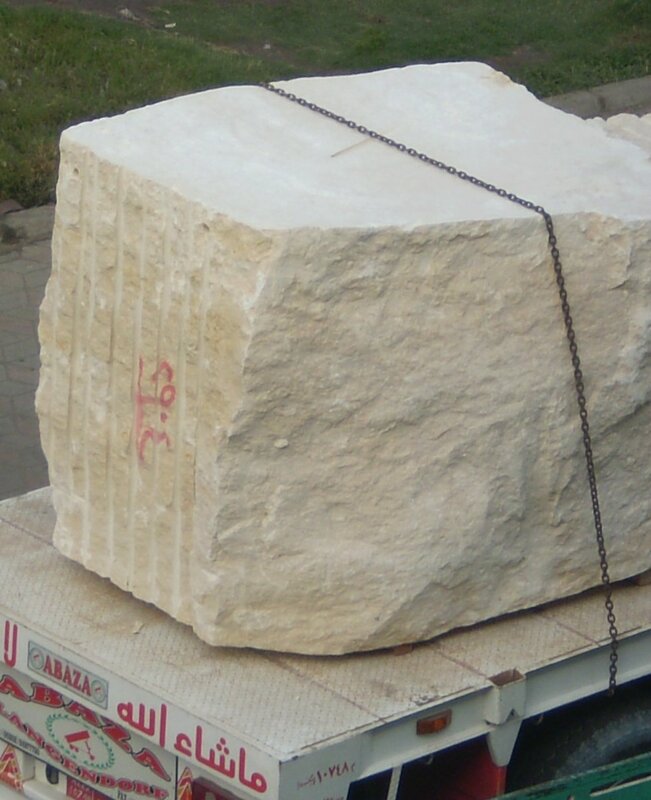 But if the ‘face’ of the Great Sphinx is not Khafre’s, as most Egyptologist believe, then whose face is it? 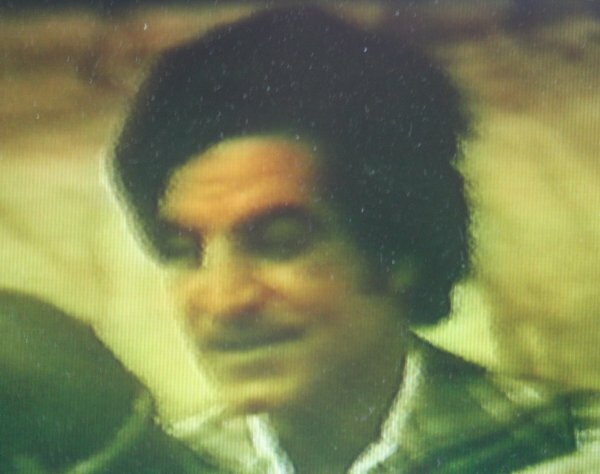 In my opinion it is not the face of a pharaoh but that of a ‘god’. But which god? The answer may be, yet again, found in astronomy or, as much as I dislike the terms, in astrology. This is because in 10,500 BC the Great Sphinx would not only be gaxing at equinoctical zodiacal Leo, but also at another zodical constellation which was also equinoctical: Aquarius. In the Dendera Zodiac Aquarius is the only zodiacal constellation which is distictly Egyptian, being the image of the Nile god Hapy, seen as a man wearing the royal double crown and holding two small jars from which is seen water pouring out. 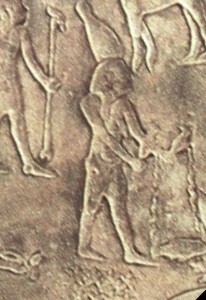 Image 10: Aquarius as Hapy on the Zodiac of dendera. 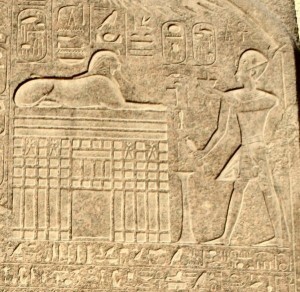 This quasi-similar image is also found on the so-called Dream Stele found between the paws of the Sphinx, where the pharaoh Thutmoses IV is performing the same water ritual in front of the Great Sphinx. Image 11: Thutmoses IV as ‘Aquarius’ ? POSTSCRIPT: Pliny the Elder (1st century AD) refered to ‘Timaeus the Mathematician’ (Timaeus of Licra 5th century BC) as follows: “He says that this takes place at the rising of the Dog-Star [Sirius], when the sun enters the sign of Leo, and stands in a vertical position over the source of the river, at which time at that spot there is no shadow thrown [the summer solstice as seen at Aswan at noon]. ” The Natural history, Liber V, chapter 10. 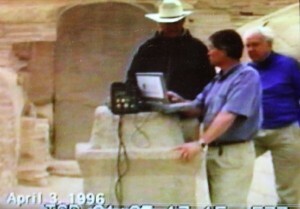 Dr. Gurshrein also suspected ‘water rituals’ at the Great Sphinx. [HASTRO-LOG9902 Archive Note 11 Feb 1999]. 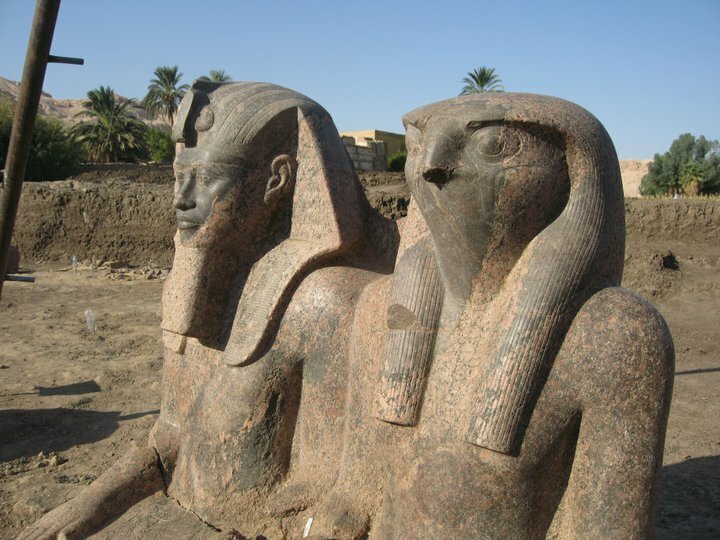 WHAT DOES THE GREAT SPHINX REPRESENT? Since the early 1990s I have shown that the Great Sphinx of Giza was intended to represent the zodiacal constellation of Leo at the epoch of 10,500 BC when this constellation was rising directly in front of the Sphinx due east, and that this remote epoch was regarded as the genesis of the pharaonic civilization which was known as “Zep Tepi” or “First Time”. 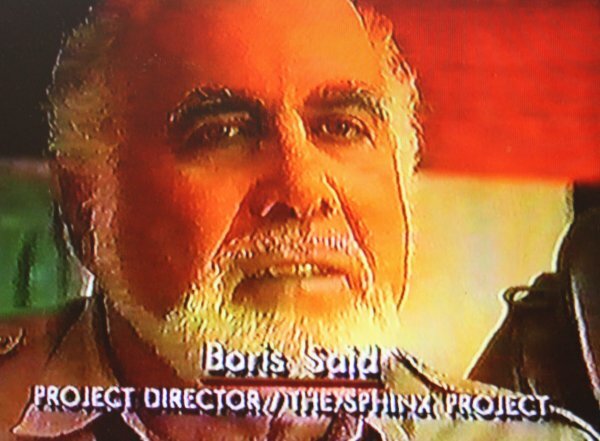 My premise was not to claim that the Sphinx was actually built in 10,500 BC but rather that it was an astronomical marker for that remote time. The full argument of this theory was presented in a book I co-authored with Graham Hancock in 1996, Keeper of Genesis (Message of the Sphinx, in the USA). 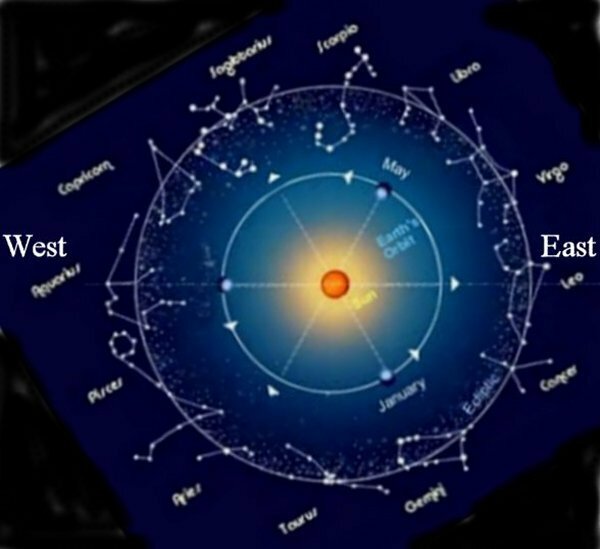 There are only two times in the year when the constellation of Leo could be rising due east: Spring equinox and Autumn equinox. It is an observable astronomical fact that when Leo is seen due east, Aquarius would be seen due west, and vice versa i.e. 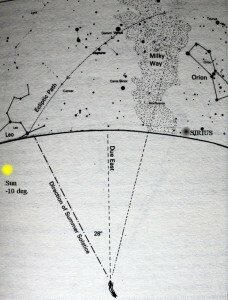 when Aquarius is seen due east, Leo is seen due west. 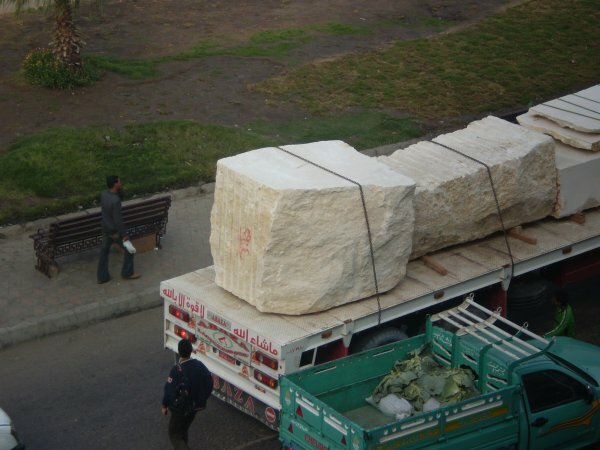 In other words that the two horizons, east and west, are somehow to be considered with the Great Sphinx. It is an observable fact that Leo will occupy both horizons, once at sunrise in the east, and once at sunset in the west, but it is only around 10,500 BC that the position of Leo would be DUE east at sunrise, and DUE west at sunset, in the general alignment of the Great Sphinx –head directed east, and hind part directed west. 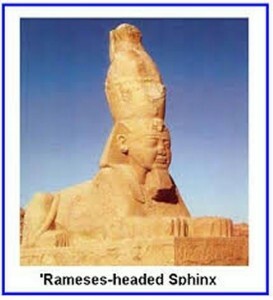 In my book Keeper of Genesis, I showed that the celestial counterpart of the Sphinx i.e. 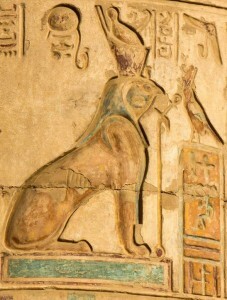 Leo, was known to the ancient Egyptians as Horakhti, which means “Horus of the TWO Horizons” i.e. east and west. The ideal astronomical symbol for Horakhti would, therefore, be a merger of Leo and Aquarius, thus uniting two horizons. 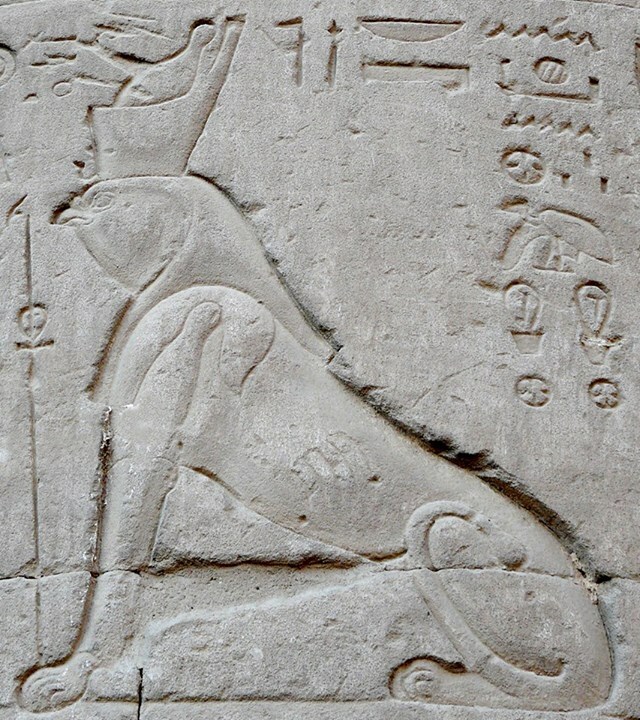 The ‘Leo’ part of the Sphinx is clearly its Lion body. Could the human head with the nemes (royal head-cloth) be symbolic of ‘Aquarius’? If so, was this how did the ancient Egyptians imagine Aquarius to look like? The earliest example is found on the Dendera Zodiac, now displayed in the Louvre Museum in Paris. Aquarius is shown as a standing man dressed as a pharaoh wearing the nemes head-cloth and the royal crown of the south. 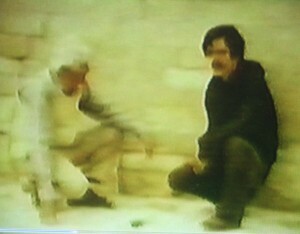 The man is holding two small water from out of which water is seen pouring. 1. 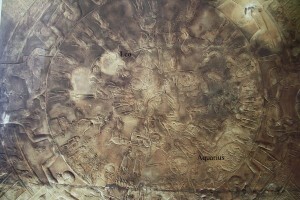 The Dendera Zodiac. 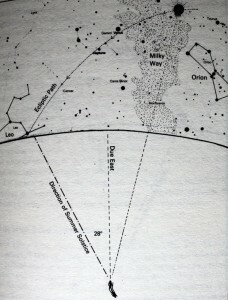 Note Leo and Aquarius in oppsodition, east and west. There are several depiction of the Great Sphinx dating from the New Kingdom showing it wearing the nemes and the royal white crown. There is, in fact, a hole on the top of the Great Sphinx’s that is thought to have been a socket to support a royal crown. 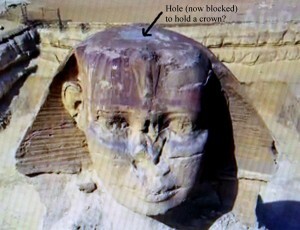 Selim Hassan, who excavated at the Sphinx in 1936 believed that this might have been the case: “the hole which existed in the top of the head may have originally been a socket for the insertion of a crown of wood, stone or metal.” [Hassan, The Sphinx, 1949, p. 103]. The author and orientalist, Robert Temple, found a photograph taken in 1896 with on it a handwritten inscription at the bottom that reads: “Some successfull [sic] at the foot of the Sphinx have recently veen carried out by col. Raum. In 1896 the stone cap was discovered –the discovery seems to have been of much advance by Dean Stanley who in his travels wonders a propos of the collosal head of the Sphinx ‘what a sight it must have been when on its head was the royal crown of Egypt.’ [Temple, Robert. 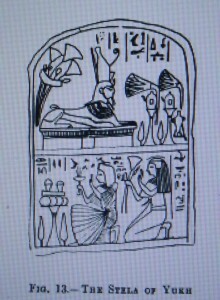 The Sphinx Mystery, 2009, p. 23]. 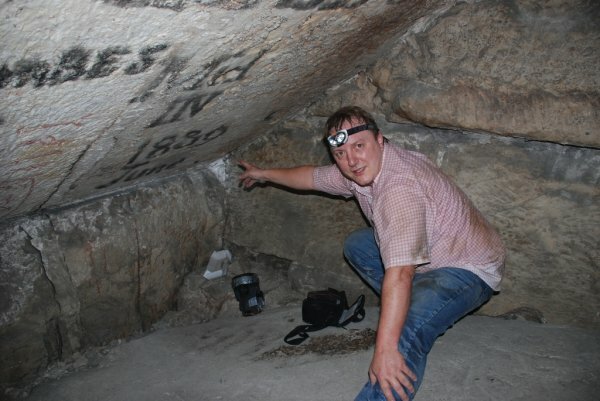 Apparently colonel George Edward Raum was an American from San Francisco who came to Egypt in 1895, and excavated at the Sphinx in February 1896 when he allegedly found the ‘rock crown’. More interestingly still, almost the same figure of ‘Aquarius’ is shown on the so-called Dream Stela that stand between the paws of the Great Sphinx. 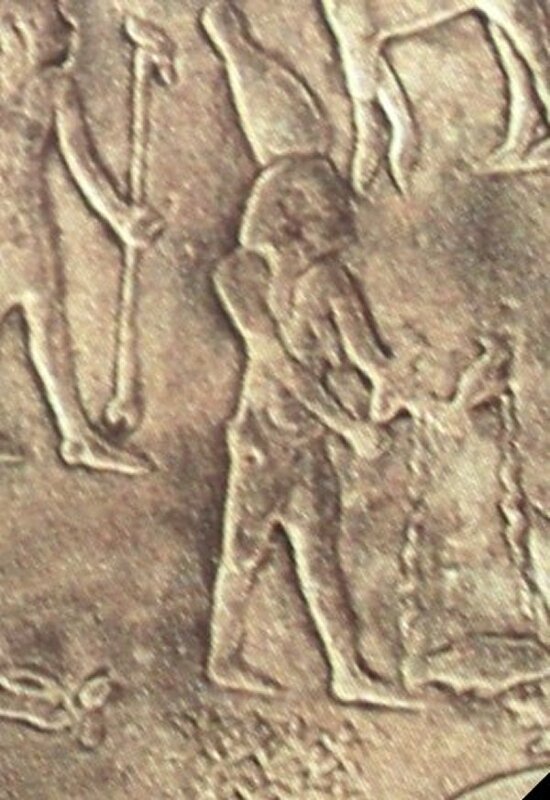 The figure is the pharaoh Tutmoses IV standing in from of the Sphinx (or in opposition) who is depicted holding a small cup from which water is pouring (a second cup is also shown above his hand). 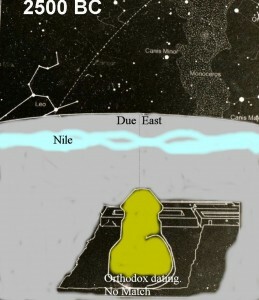 My conclusion, based on the archaeological evidence and the astronomical alignment of the Sphinx leads me to concluded that the Great Sphinx is an earthly image of Hor-Akhti merging the “two horizons” occupied at the equinoxes by the zodiacal constellations Leo and Aquarius in 10,500 BC as they stood in apposition, due east and due west. NOTE: The eminent Russian astronomer, Alexander Gurshtein, one time President of the IAU (International Astronomical Union) Commission for the History of Astronomy, had also suggested in 1999 that the Great Sphinx was symbolic of Leo and Aquarius, although when these constellation marked the summer and winter solstices respectively i.e around 3000 BC. He also suspected that ‘water rituals’ were involved. Well Mr. Lacovara is a bigger Quacademic than I thought! He even sound (almost) like the King of Quacademics himself, his Excellency Doctor Zahi Hawass. 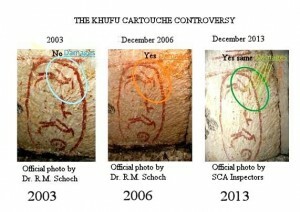 So here for Mr. Lacavara’s personal benefit is again the uncontestable, smoking-gun, irrefutable, undeniable, “see with youe own eyes” proof that the samples were scratched off the Khufu Cartouche BETWEEN 2003 and 2006 –which is at least SIX YEARS BEFORE the “crackpot Germans” (to use your own derogarory term) supposedly performed this crime. And which, by the way, makes Zhi Hawass fully responsible since he was the Secretary-General of the Supreme Council of Antiquities in 2003-6. As the old saying goes, put that in your pipe (or elsewhere if you wish) Mr. Lacovara, and smoke it. SEARCHING FOR THE “HALL OF RECORDS” AT GIZA: Was it legal? These claims are made in the biography of Hugh Lynn Cayce: “Hugh Lynn Cayce: About my Fathers Business” by A. Robert Smith, 1988, p. 250. 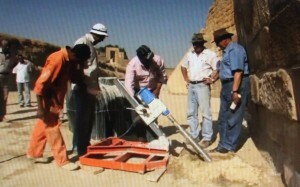 Amazingly, in July 2009 Mark Lehner supervised further drillings at the Sphinx, and specifically one under the paws of the Sphinx “on behalf of Hawass.” Using the pretext that they were checking the level of groundwater under the Sphinx, Lehner unabashedly stated, “It’s a good chance to test many ideas, any new-age ideas about secret passages and hidden chambers under the Sphinx.” Working with the University of Cairo, a 10-centimeter-diameter drilling tube was used to punch a hole under the left paw of the Sphinx, going all the way southward to the right paw, the very place that Hugh Lynn Cayce had desperately wanted to inspect back in 1978! 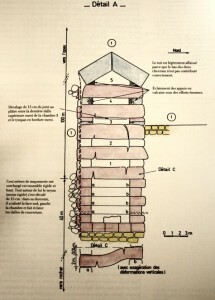 Yet with a sarcastic grin on his face, Lehner went on to say, “With all this drilling it should be possible to put to rest all these theories that there is some kind of tunnel or chamber under the Sphinx” (from Heritage Key Video by Sandro Vannini: www.youtube.com/watch?v=3qGzfZHWbZE). Zahi Hawass to Drill Under the Sphinx! 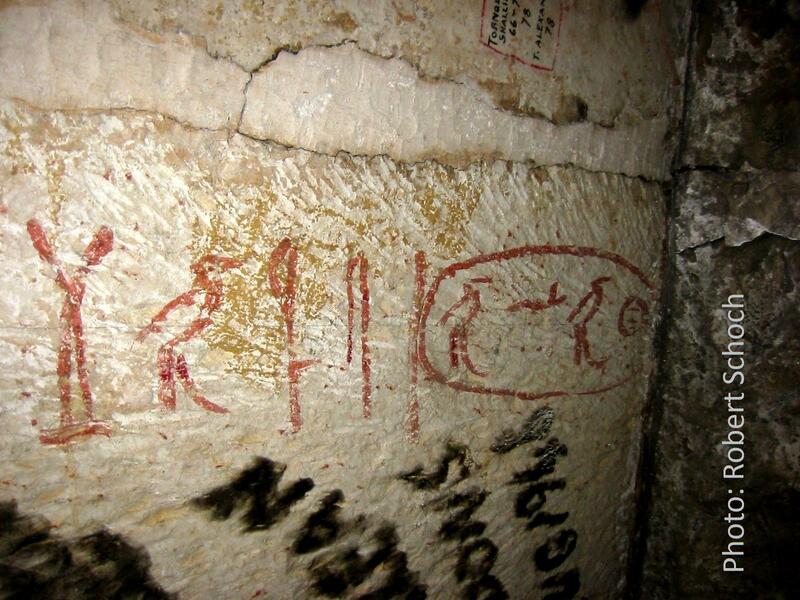 THE MYSTERY OF THE “KHUFU CARTOUCHE AFFAIR” IN THE GREAT PYRAMID: WHO IS GUILTY?…. As it is well known, I have defended Dominique Gorlitz for having been wrongly accused of “damaging” or taking samples of the graffiti Khufu Cartouche in …Campbell’s Chamber of the Great Pyramid in April 2013. 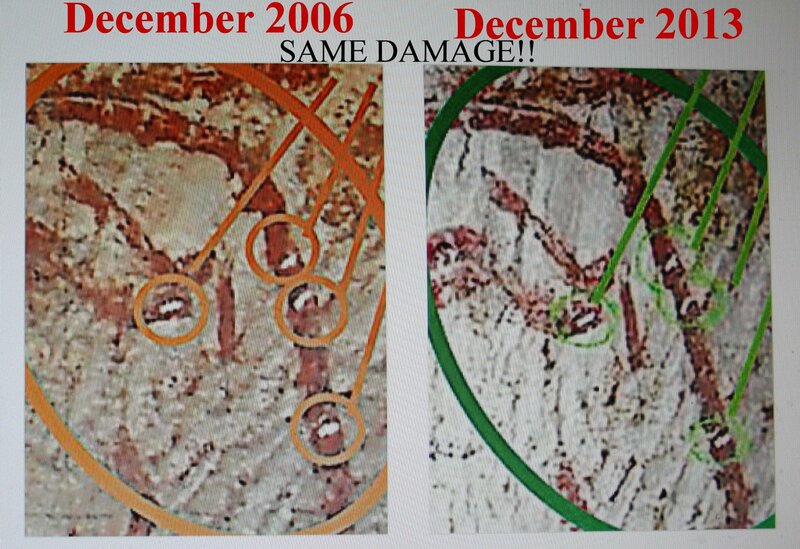 This was because irrefutable evidence has come to light that the samples (4 scratch marks on the right rim of the Cartouche) were already taken by some unknown person(s) between July 2004 and December 2006. 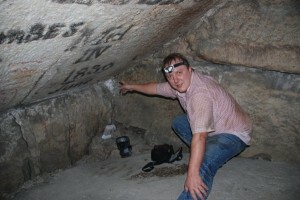 And although Gorlitz is definitely guilty of taking a sample from ANOTHER graffiti hieroglyph (also in Campbell’s Chamber) in April 2013, as well as samples of black soot from the ceiling of the King’s Chamber, he is definitely NOT GUILTY of damaging the Khufu Cartouche, since the first time he went to Egypt was in April 2013. 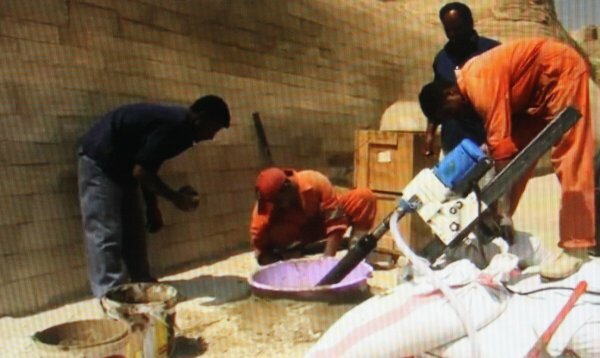 But things are not so certain with his colleague, Stefan Erdman, who was also with him inside the Great Pyramid in April 2013. Erdmann has been visiting the Great Pyramid since the early 1990s, and obtained many “private visit” permits to do research inside the Great Pyramid and take samples (of stones inside and outside the Great Pyramid), three of which were in the course of the year 2006. Erdmann has provided written affidavits to this effect, but categorically denies that he took samples from Campbell’s Chamber in 2006. 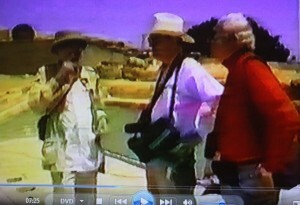 The purpose –or one of the purposes– of Gorlitz and Erdmann of entering the Great Pyramid on a “private permit” in April 2013 was to shoot footage for a TV documentary they intended to produce. 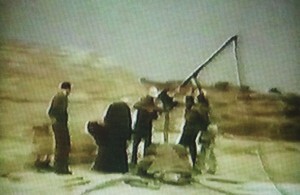 This is the reason they took along a camercamen called Jan Gartig. 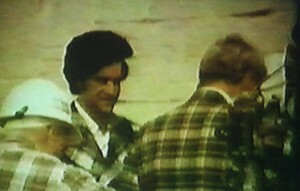 The latter was working for Frank Hofer, a TV documentary producer. Hofer was responsible for making a trailer for the documentary which he published on his website as well as many other host websites. A few weeks ago, in mid-July, it has come to my attention that this trailer (which was taken off the Internet in December 2013) was also accompanied by a text/blurb written by Frank Hofer. 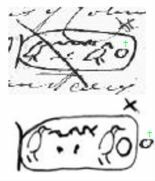 This text makes it clear several times that samples were DEFINITELY taken from the Khufu Cartouche! (see link in my next comment below). But if so, this could only have happened between July 2004 and December 2006, making Erdmann (and not Gorlitz) a PRIME SUSPECT. All three men -Erdmann, Gorlitz and Hofer— insist that the text/blurb that came with the trailer and written by Hofer was a “mistake”. I must admit, however, that I find this very hard to believe. THE FIRST SECRET SEARCH in 1977-8. A FOURTH SEARCH IN 2009?……. I have read Scott’s article in the July/August 2014 issue No. 106 of Atlantis Rising. 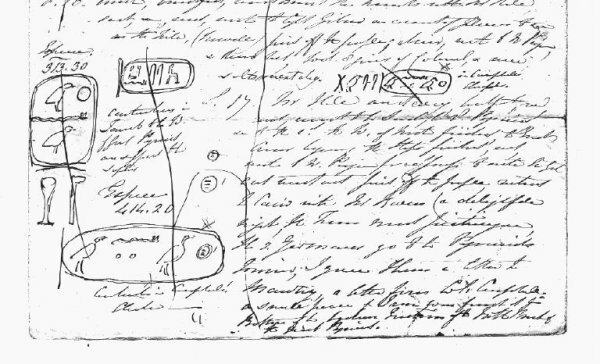 Scott bases his case on a page from Howard Vyse’s diary, where various cartouches bearing the name “Khufu” are seen. 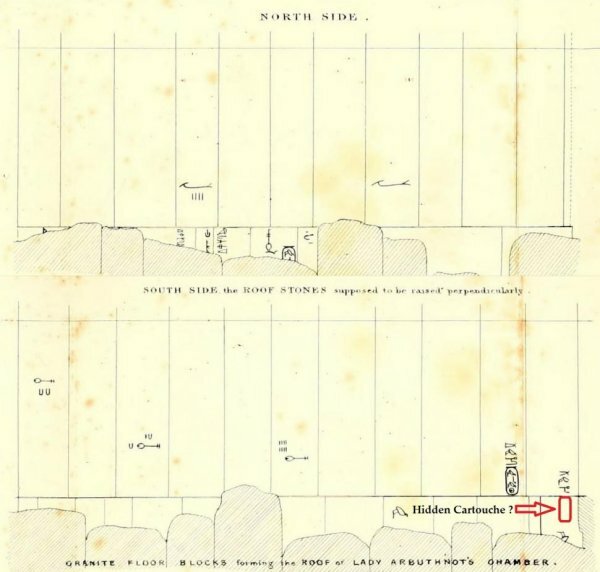 Notwithstanding the rather confusing argument about what Howard Vyse allegedly “intented” to do, Scott’s hypothesis (and it is one) all boils down to TWO DOTS that may or may not be there. Without those two dots, his whole case falls down like a pack of cards. Let us take a closer and unbiased approach. 1. 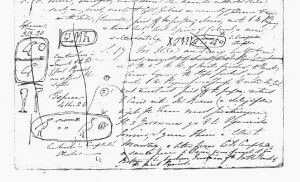 Here is the part of Vyse’s diary which shows the Cartouches. 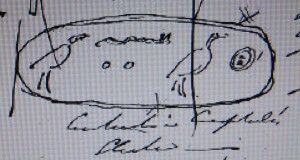 It is evident to me that Scott clearly omitted to add the dark line that is slashed across the Carouche, and it is clear that he wanted to highlight the TWO DOTS under the snake sign. But are the TWO DOTS really there? 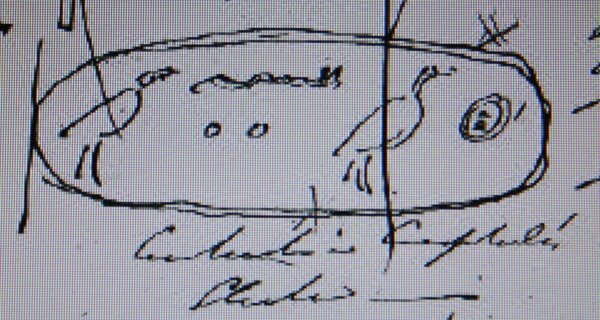 Admittedly there are markings that COULD be TWO DOTS but clearly not as visible as Scott shows them in his own drawing, or wants them to be. And what about the dark line that slashes the cartouche and partially covers the POSSIBLE two dots? What does it mean when someone slashes a drawing this way? 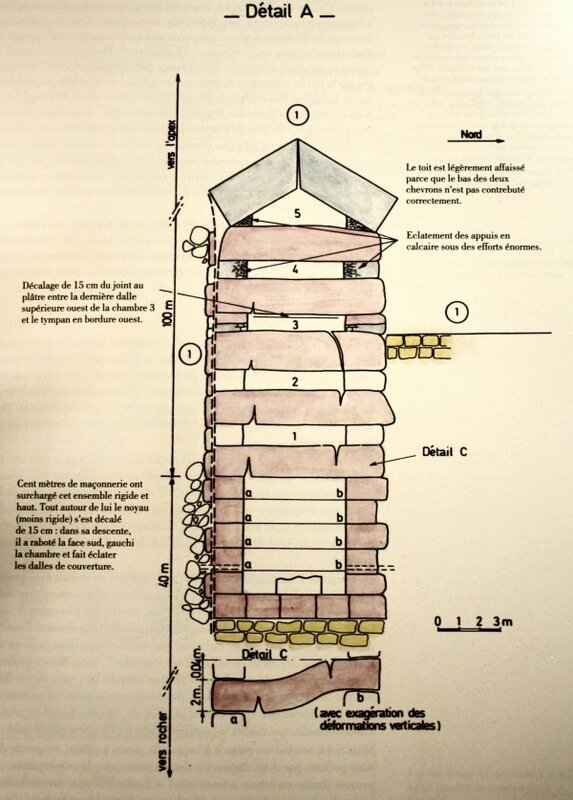 Does it not mean, perhaps, that this drawing is wrong” or “ignore this drawing”….? 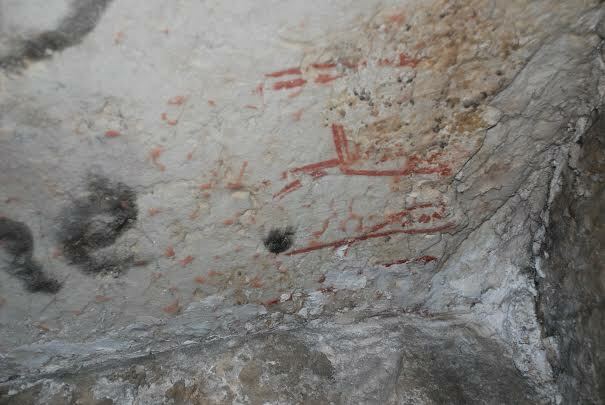 And furthermore does not the little “X” sign on the top right also means “wrong drawing”? And does this not also explain the cartouche at the bottom of the page which is, in fact, the correct reproduction of the ACTUAL cartouche in Campbell’s Chamber? 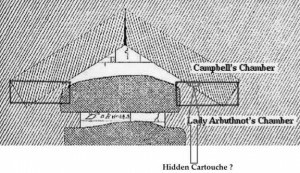 The obvious discrepancy between the original drawing by Howard Vyse and the drawing made by Scott Creighton in the Atlantis Rising article in issue 106, July/August 2014 has already been pointed out by Martin Stower. I tend to agree with him that Scott WANTED to see TWO DOTS when they may in fact not be there at all. For without those precious TWO DOTS, his hypothesis does not work.